Maine Maritme Academy scholarship campaign co-chairmen Larry Burrill and Wayne A. Norton, flanking left and right, academy President Bill Brennan, middle, and scholarship recipients Anthony Franchetti, Riley MacLeod and Ashley Elder celebrate the kickoff of a $20 million campaign on March 28. A $20 million fundraising campaign singularly dedicated to doubling available scholarship money to Maine Maritime Academy students is officially under way. 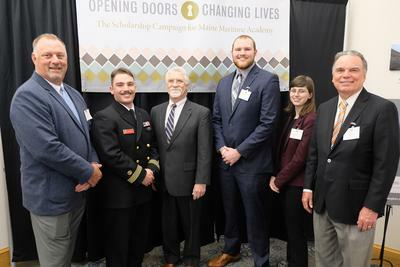 The campaign, dubbed Opening Doors, Changing Lives: the Scholarship Campaign for Maine Maritime Academy, officially launched on March 28 during a banquet held on campus. Academy President Bill Brennan announced that the campaign had already received $10 million from the estate of Captain William Bullard, the largest single philanthropic gift in the academy’s history. During the banquet, students, faculty, members of the board of trustees and the campaign’s steering committee were informed of the benefits of the campaign. Current students receiving scholarship money gave testimonials about how that money has helped them afford an MMA education they may not have been able to otherwise. The academy gives out just shy of $1 million in scholarship money annually, but with 80 percent of the student body in need of financial aid, it is still not enough to compete with schools that have larger endowments. During the kickoff event, $100,000 was contributed in cash and pledges to add to $3.9 million raised during a quiet phase of the campaign, bringing the total raised to date to $14 million. The campaign is slated to run through June of 2022.